Hey dolls! Pretty & Polished was one of the first indies on the scene several years ago and it’s been amazing to watch the brand grow. It has expanded to include bath, body, and nail treatments/products and now they have started a Beauty Box subscription program. The box includes 2 full size polishes that are exclusive to subscription holders. It will also include at least one mini bottle of a current polish, a bath/body product, other extras, and an exclusive coupon code. Pretty & Polished Liquid Gold is a duochrome with scattered holo shimmer that shifts from gold to pink. I just love this shade! The formula was on the sheer side, but built up quite nicely. Three coats were used for opacity. 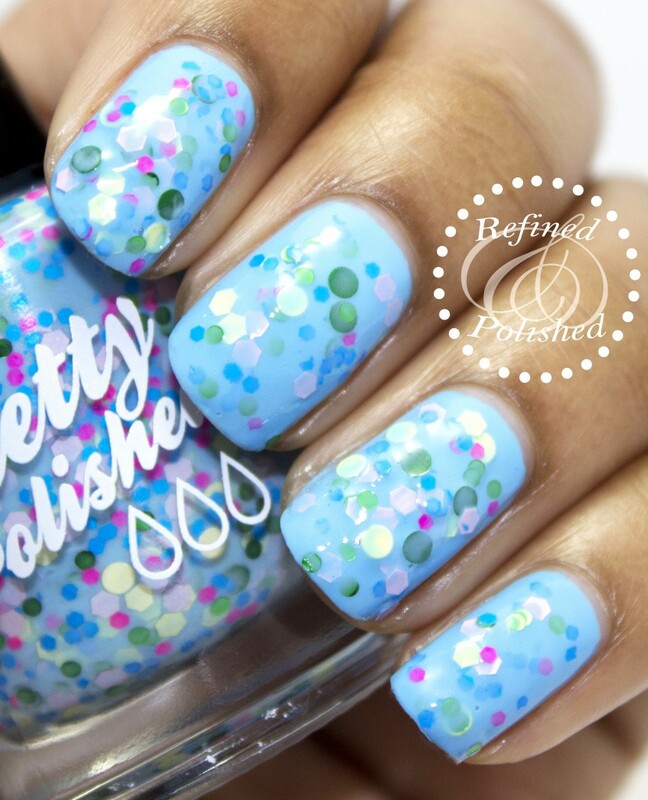 Pretty & Polished Day in the Park is a sky blue crelly filled with a rainbow of glitters in various shapes and sizes. This polish is jam packed with glitter! I tried to wear it alone at first, but it was almost too much glitter and not enough base color at two coats. I ended up dabbing one coat over Cult Nails Nakizzle’s Shizzle and I like the way it looks. Top coat is a must to achieve a glossy finish. If you prefer chunkier glitters, you could definitely wear three coats of Day in the Park alone. The mini bottle included in my box was Pretty & Polished Jawbreaker. This was my first white based glitter and I’m pretty sure it was one of my first indies. Jawbreaker is one of the brand’s most popular shades and is still available. I previously reviewed it here in 2012. My nails were so long then! I also tried the cuticle balm stick pictured above a few times. If you are a fan of lemon scents, you’ll definitely love this one. It doesn’t linger long, which is fine by me. This was my first time using a cuticle balm in this type of container, but it was easy to use. I outlined my cuticles and the skin around my nail and then massaged the balm in. It absorbed nicely and didn’t leave behind a greasy or oily residue. The Pretty & Polished Swift Sparkle Top Coat was used on the Day in the Park mani above and on a few other swatches. My initial impression is that this is a good top coat. It is thin in consistency, but still smooths out glitters nicely. It took about fifteen minutes before my nails were completely dry to the touch and did not smudge. I’m going to keep trying this top coat over the next few months to really see how well it works with a variety of brands and over time. I didn’t have a chance to use the small, silver nail art beads, but they seem like they would make a cute accent nail. Overall, I think the Pretty & Polished Beauty Box is a pretty awesome idea and well worth the $22 price (includes shipping; $30 for international orders). The box is available in 1, 3, 6, and 12 months increments and purchasing a longer subscription guarantees your spot in the event that there is limited availability. For those of you who are fans of Pretty & Polished and you like to own exclusive polishes, the Beauty Box subscription is a perfect concept. You can sign up for your subscription here. Be sure to keep up with Pretty & Polished on facebook, instagram, and twitter for new releases, giveaways, and specials.